It amazes me how many travelers to Southern California are flying into LAX instead of Orange County&apos;s John Wayne Airport. I have to imagine it is because they don&apos;t realize what they are signing themselves up for when they book that flight into LAX. On a recent press trip, my fellow journalists and I were discussing airports and we all agreed that LAX is the worst major airport in America. How bad is it? Well, my husband and I both have jobs that require us fly frequently and we both kick and scream like small children whenever we get booked on a flight out of LAX. We have been spoiled rotten by our pleasant experiences at John Wayne Airport and sing its praises to all that will listen. Here are 5 reasons why you should be flying into John Wayne Airport instead of LAX when you visit Southern California. 1. Everything you want to see while visiting Southern California is in Orange County anyhow! The majority of people visit Southern California for three reasons; great weather, beautiful beaches, and Disneyland. The weather in the cities surrounding John Wayne Airport is some of the most pleasant in all of Southern California due to its coastal proximity and lovely breezes which keep all that LA smog far off in the distance. The beaches in Orange County are among the most gorgeous in the country; from the wide expanse of sand at Huntington State Beach to the dramatic bougainvillea-draped cliffs of Laguna Beach to the legendary surf at "The Wedge" in Newport Beach. Disneyland, the number one tourist draw for all of California, is less than 15 miles away from John Wayne Airport. That drive is a breeze compared to the 40-mile, traffic-choked journey you would have to make from LAX. 2. Getting in and out of John Wayne Airport is easy. John Wayne Airport is located where the 405 and 55 freeways meet. The airport literally backs up to freeway, and getting in and out is simple. Locals love that they have the option of valet parking directly in front of the terminal. Many Irvine hotels offer complimentary shuttle service to and from the airport. Those who need to rent a car once they arrive at John Wayne will find seven different rental car companies have counters at the terminals and eleven other rental companies which pick patrons up in front of the terminals and shuttle them to their locations. 3. The atmosphere is pleasant and the wifi is free. These days, we spend more and more time inside terminals waiting for our flights. John Wayne has three beautiful terminals that are interconnected on both sides of security and are lined with shops, restaurants, and artwork from local artists and galleries. Wifi inside the airport is free. LAX has nine dark and aesthetically dull terminals which are not connected. Trying to get from terminal one to terminal nine basically requires you to take you life in your hands as dart across traffic like the frog in the classic Atari game, Frogger. 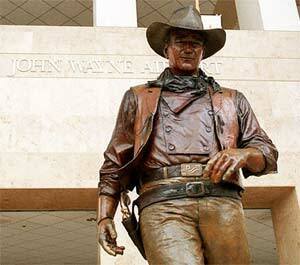 Read more about John Wayne&apos;s beautiful art installations. LAX has the worst food options I have seen in any major airport, partly due to the fact that its outdated design does not allow for anything but a couple simple food courts with a Starbucks and a McDonalds. John Wayne has the token Starbucks and McDonalds, along with some delicious options which reflect the tastes of the local community. Chef Zov Karamardian&apos;s is a legend around Orange County who has been serving up Eastern Mediterranean food in her popular restaurants for years. Now airport patrons can enjoy lentil soup, tabbouleh, and much more at Zov&apos;s between terminals B and C. They can also enjoy the same classic burger and shakes at Ruby&apos;s in the airport that they can get at the end of the Huntington Beach Pier, gourmet hot dogs at Jerry&apos;s Wood-fired Dogs, fresh soups and salads at Farmer&apos;s Market by Laguna Culinary Arts, and a glass of cabernet at Vino Volo wine lounge. We all like to get where we are going as quick as possible, and direct flights are the easiest way to do it. Residents of major US cities such as Atlanta, New York, Chicago, Dallas, Denver, and Seattle can all access Orange County directly as well as international destinations such as Vancouver and Puerto Vallarta. Best of all, flying into John Wayne from international destinations means you get to skip the dreaded Tom Bradley international arrival terminal at LAX. There is nothing worse than landing at LAX and approaching the immigration lines only to discover a jumbo jet from Asia just landed and hundreds of passengers are standing between you and the other side of customs. Trust me. Image courtesy John Wayne Airport. Sharlene Earnshaw is a mother of 12-year-old twins and a true California girl at heart. She gets excited about 80 degree beach days in January and the wealth of outdoor opportunities in her own backyard. Sharlene has lived all over California but has been thrilled to call Orange County home for the past seven years and plans to never leave her little slice of paradise. She is the Editor-in-Chief of Trekaroo, the nation's leading independent family travel website.